Going on a first date with a man can be a little awkward. This is especially true when you have no idea what to talk about! This is why knowing some of the right things to talk about on a first date can be very important. Try to remember that a first date is when it is important to get to know a little bit about a guy so that you will know whether or not a second date will be desirable. Try to think of something you can discuss to help you get some insight into the type of person he is. This can be a little challenging because you really do not want him to know that you are sizing him up but at the same time try not to worry about it as chances are he is going to be sizing you up as well. Some of the following conversational topics may be the best when it comes to what you should talk about on your first date. Instead of starting out by asking him a series of questions it might be best to mention, in passing, some of the things that interest you. These things can be the genre of music you enjoy or the physical activities you like or even who your favorite author is. Once you open the lines of communication he is either going to tell you that he doesn’t like to read at all or who his favorite author is. He may disagree with everything you like or you may find that you share more in common than you realize but this is one good way to find out. You probably do not want to date a guy who brings a different woman home every night of the week so finding out where his head is in terms of the type of relationships he enjoys may be a good idea. Obviously if he mentions more than a few exes in a period of just a few years it may be safe to assume he is the problem. Again, you must not try and make this seem like a drilling session but at the same time these are all important issues when trying to get to know someone. Do not forget however, that when you open up this can of worms you are going to have to be honest about your dating and relationship history as well. If you are dating a college student talk to him about his major and what his plans for the future are. If he has a career then find out more about what he does. This is a very good way to find out off the bat if he is a complainer who seems unhappy in his life. Nine times out of ten bringing up a man’s job will get him talking about how much he loves his work or how much he hates his boss and all sorts of other drama in the work place. If you find that you are turned off by anything he says about his job or school then you may want to consider the other traits he may have that will drive you crazy like nails on a chalk board. Talk about place in the world he has been. This is a good way to find out where he may see himself living at some point in the future. If it is a place you would never dream of going then maybe this will clue you in on the fact that your future together may be bleak. On the other hand you may find that you both dream of someday moving to a tropical island somewhere. Perhaps you will find that you have both traveled to some of the same places and will end up having a nice conversation about that. This is very important to women who either cannot stand pets or who love them. Many times this can be a major deal breaker in a relationship. For example, you love cats and own four of them but find out that he is deathly allergic to cats or vice versa. If you are an animal advocate then you will probably want to know if he agrees with hunting just for sport, especially if this is something that turns your stomach just to think about. Pets and animals are a very big part of our daily lives so this is something important to know about the guy you are dating. While it may not seem very important on your first date, it can easily become an issue if things should become serious and the two of you wind up clicking. 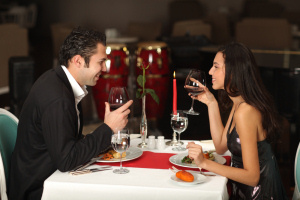 All in all, the most important thing about conversational topics on a first date are the things that will let you know how much you enjoy the person you are on a date with. Remember that contrary to what some people may say first impressions are not always the most important. Keep in mind that your guy may be quite nervous during that first date and he may not be acting quite like himself. He may even tell you things he thinks you want to hear that wind up having the opposite effect. If you find that you are attracted to him then give him a second and even a third chance to show his true colors before jumping to conclusions about who he is. Remember, he is also trying to get to know you so make sure you are as honest as possible when talking with him.